Durian is a fruit which is well liked in Southeast Asian countries, but westerners usually do not want to try it because it has a pungent smell that is difficult to describe. Some people compare the penetrating odor of durian to cheeses like limburger. Airlines and hotels in Southeast Asia do not allow clientele to enter them with durian in their possession. 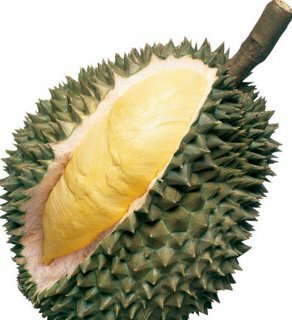 Durian has a very thick and thorny husk, which usually is opened with a machete or large knife. The color of the skin is yellowish green. Inside there usually are large sections [phuu] that are pale yellow in color and covered with a thin membrane undetectable to the tongue. At the center of each section is a large, brown seed that is discarded. The flesh is like a thick, rich, mildly sweet custard or soft cheese like brie. It is claimed that they are very high in cholesterol, and there are recurring reports of older people addicted to the durian dying from overeating it. The durian is roughly the size of a soccer ball. The very best durians are, per kilogram, the most expensive of all fruits during a normal harvest year. It is often eaten with sticky rice and coconut cream or used to flavor ice cream.